Where do I use my Clarins voucher code? Search NetVoucherCodes to find a code, copy it and go through to the Clarins website to start shopping. Go to ‘my shopping basket’ when you’re ready. Paste your code into the ‘Promotion code’ box provided on the ‘My Shopping bag’ page. Click apply to redeem your discount and the ‘checkout’ button to finish the payment procedure. Clarins Laboratories are pioneers in the fields of plant science and technology. They produce beauty care products using groundbreaking formulas from 100% pure plant oils, double serum, skincare solutions for the face and body to top quality cosmetics, men’s skin care and treatment fragrances. You'll get free samples with every order and free delivery with a minimum spend. Using a discount voucher code from Clarins is a great way to save money on your purchase. The voucher codes will save you money on a minimum spend e.g. "£10 off when you spend over £40 " or general savings such as "Save 33% off your Order online" or "Get a free Slimming Kit with your Order". Just enter the code at the payment stage to see an instant reduction in your bill or receive your free items. Always check Netvouchercodes before placing your order to see what voucher codes or special offers are available at Clarins. You'll find a range of deliciously scented treatment fragrances at Clarins which are a combination of essential oils and plant extracts that have aroma and phytotherapy benefits. Choose from Eau des Jardins which uplifts, refreshes and captivates or Eau Dynamisante, for both men and women that gives vitality, freshness and firmness, while Eau Ressourçante provides serenity, freshness and balance. Clarins Sunshine Fragrance is an uplifting treatment fragrance designed to be sprayed all over your skin from top-to-toe. On the Clarins website, you'll find a special offers section. where you'll find some amazing deals and offers of free gifts, like choosing 4 trial sized products or a free luxury gift with a minimum spend or select products sold at discounted prices. If you sign up for the Clarins Newsletter you will be among the first to hear about these amazing, money-saving offers so need never miss out on the best deals and can snap up these discounted products before they are sold out. Express Next Day delivery is £5.95 - order by 2pm Monday to Friday. Sunday delivery by 12,30 is £10.99 - order by 4pm Friday. Do I have to Register on the Clarins website to place an order? No you can check out as a guest. If you do register, however, you will be able to track your orders, check your order history, collect reward points and save time when ordering in the future. Clarins was established in 1954 and has been producing luxury cosmetics ever since. From plant to the product - the site promotes ‘responsible beauty’ as Clarins’ researchers use over 1,000 ingredients from plant-based extracts, rather than synthetic ones, with all plants grown locally or in a fair trade program. Use a Clarin's promotional code and save on everything from Face, Body, Make-up, Sun, Men, Gifts & Sets and Spa treatments. 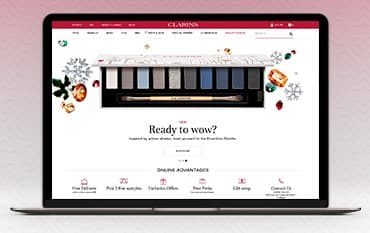 With free delivery on orders over £50, 3 free samples with every order and a point-per-pound loyalty scheme there are beauty-bargains galore on Clarins and many a glamour-appealing deal to behold.